Urban artistic and creative witches, this one's for you. A Wiccan priestess of forty years opens her magical cabinet to share the treasures inside: doing spells, moon magic, symbolism, talismans, goddess ritual, magic circles, sacred space. Suzanne Corbie was initiated into a coven age 18, and undertook a rigorous apprenticeship in the magical arts. Now she's a loved and respected mentor to younger generations. Her five-week course is hands-on and as experiential as they come, so you will can take the knowledge into your art and life. Dates: Thurs 18 May, Wed 24 May, Wed 31 May, 7 June, 14 June. 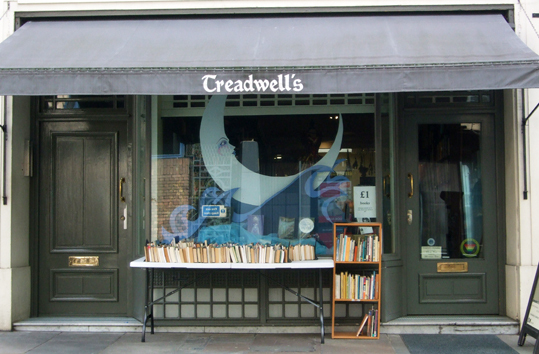 If you prefer not to sign up online, you can reserve a place by calling 020 7419 8507 or emailing info@treadwells-london.com. The photo at the top shows Treadwell's store front.